We visit the birthplace of Chinggis Khan in the village Dadal and go to Mongol Daguur, the strictly protected area, with many small lakes, where endangered bird species can be seen. In the morning arrival at Chinggis Khan Airport in Ulaanbaatar and transfer to the hotel. Short break after breakfast and start of city tour including the Gandan Monastery and the National Museum. Visit the Choijin Lama Temple Museum after lunch, dinner at the hotel. Today we will start our trip eastward. Drive to Avarga Toson, located close to the Avarga River with a mineral spring and the lake Toson with health resort. Stay the night in ger camp. Head to Undurkhan in the morning, which is the provincial city of Khentii Aimag. Visit the ethnographical museum in the palace of Tsetsen Khan, a Mongolian sovereign of the 18th century and stay the night in hotel. Continue our trip northeastern. Arrive at Chinggis Khans birthplace, Deluun Boldog, located in the Dadal village, in the middle of Semi-Taiga area. Dinner and stay the night at the ger camp. In the morning, we will visit memorial places of Chinggis Khan, which was built during the Socialist period (1962), such as lakes of Gurvan Nuur, spring Khaju Bulag and Balj River. 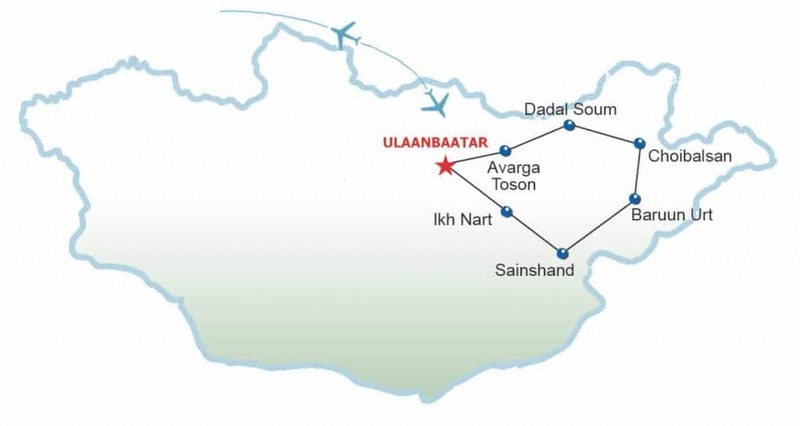 In the afternoon, we will drive eastward to visit the nature park Mongol Daguur (landscape with many small lakes and rare cranes), stay the night in tent at the river Ulz. Drive to provincial city Choibalsan, well known as Eastern Industrial Centre of Mongolia. On the way of heading for it, we have chances to observe Mongolian gazelle herd. Then, check-in in hotel in Choibalsan. 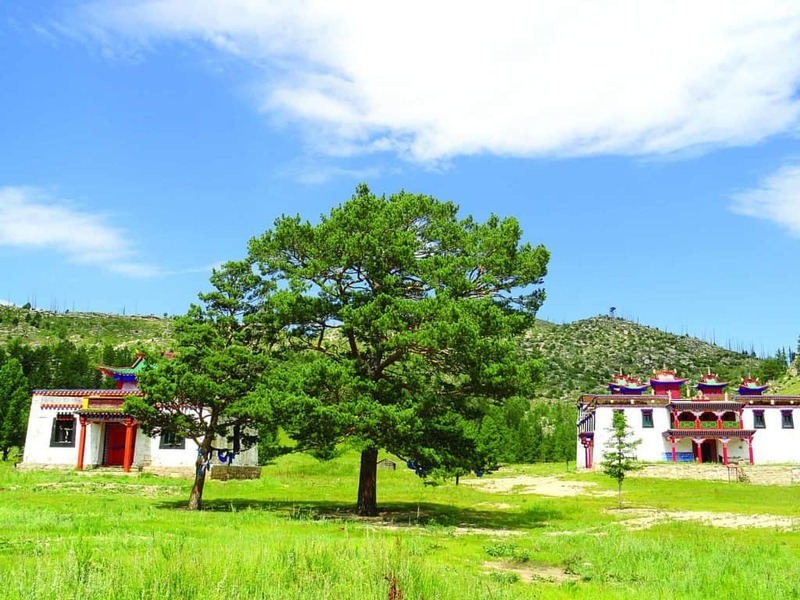 Trip to Baruun-Urt, a provincial town of Sukhbaatar located in the south-west of Choibalsan. 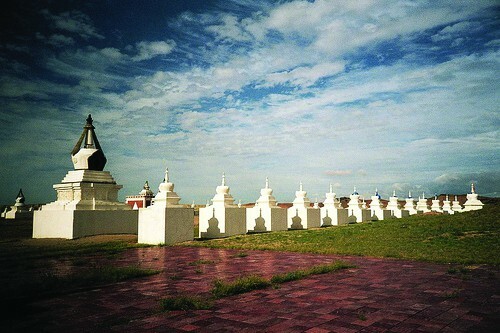 In the afternoon, visit the local museum and the monastery Erdenemandal Khiid, stay the night at the hotel of town. Drive westward to visit the provincial town Sainshand of East-Gobi Province through Semi-Gobi landscape and stay the night in tent. In the afternoon, we will reach Sainshand and visit the Danzan Ravjaa Museum. Then, a short trip to Khamriin Khiid Monastery. The energy center, the holy spring and an old meditation cave are the next destinations. Stay the night at ger camp. Drive to north-west to visit nature reserve Ikh Nart, which protects the northeastern range of wild sheep Argali habitat. In the afternoon, walk to the mountain for observation of wild sheep and vultures. Stay the night at the ger camp. In the morning, we will drive toward north-west in order to visist another wonderful attraction, nature reserve Gun Galuut, well known for rare cranes and other water birds, we stay the night at ger camp. Today we will reach Ulaanbaatar. In the afternoon, we will have time for shopping or sightseeing in the city. In the evening, farewell dinner with folklore concert and stay in hotel. Early morning, transfer to the airport and departure.